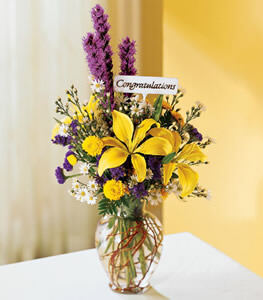 Let this exuberant bouquet express your congratulations for a job well done. Yellow lilies, purple liatris and yellow pompons are highlighted by white Monte Casino. Perfect to celebrate any personal milestone - graduation, engagement, promotion, or retirement.